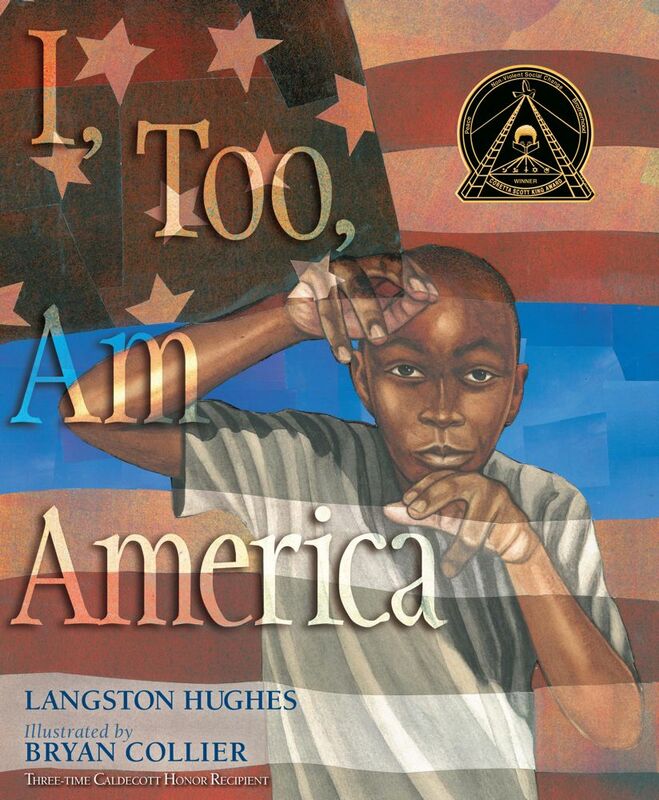 This picture book of Langston Hughes’s celebrated poem, "I, Too, Am America," is also a Common Core Text Exemplar for Poetry. Caldecott Honor artist Collier (Dave the Potter) uses Hughes’s well-known poem as text for a visual history of Pullman railway porters, one of the first jobs that offered African-American men steady pay, dignity, and a ladder into the middle class. Hughes’s lines—“They send me to eat in the kitchen/ When company comes,/ But I laugh,/ And eat well,/ And grow strong”—fit beautifully with the story of the porters, giving the poem new meaning and impact. Collier’s portraits of the porters at work alternate with bold, sweeping spreads of cotton fields, onto which a porter scatters discarded books and magazines, planting knowledge along the railway lines. The story travels from South to North and from old to new, ending in Harlem, where a contemporary African-American mother rides in a subway car, her son gazing out the window. In the next spread, he’s seen in startling closeup, parting and peering between the stripes of an all-but-invisible American flag. “I, too, am America,” he says. It’s a powerful metaphor for looking at African-American history—and the issue of race in America—from the inside out. Ages 4–8. May 2012. 40 p. Simon & Schuster, hardcover, $16.99. (9781442420083). 811. A celebration of Pullman porters is the focus of this new picture-book edition of Langston Hughes’ classic poem. The collage spreads, blending oil paintings and cut paper, begin with an image of a speeding train before moving on to large portraits of African American porters serving white passengers aboard a luxury train. When the passengers leave, the porters gather left-behind items—newspapers, blues and jazz albums—and toss them from the train. Carried by the wind, the words and music fall into the hands of African Americans across the country. The final, contemporary pages show young black people celebrating their place in America and dreaming of a bright future. Collier’s long final note explains his interpretation of the poem, and with adult help, kids can look closely at what the pictures show about the porters then and now as well as Collier’s visual themes, including the recurring use of stars and stripes, which culminate in a beautiful, final close-up of a boy with his mother staring through a train window today at the starry city sky.